"Do I get four Golden Visas for this?" jokes Yili Chen as estate agent Nuno Durao shows him round a 2m euro ($2.8m) apartment in the seaside town of Cascais. The 28-year-old, who prefers to be called Li, is from Shenzhen in southern China. He has been lured to Portugal by its Golden Residence Permit programme. It gives foreign investors who spend 500,000 euros on a property here the right to live in Portugal. They are also free to travel around all the EU countries in the Schengen area and after six years they can apply for Portuguese citizenship. Li, who got married last year, wants to send his children to European universities. He is also concerned about what the financial future may hold for China, so he is looking to invest in Europe. "You cannot put all your eggs in the same bucket. So we try to put something in Europe and this is a very good opportunity. We can earn some money and also get the visa," says Li. Since the residence scheme began in 2012, the Portuguese government says it has issued 734 so-called "Golden Visas" and that's generated more than 440m euros. Not all of that has come from property sales though, because foreign investors can also get a Golden Visa by investing a million euros in capital or creating 10 jobs in Portugal. The vast majority of the people signing up - 578 of them - have come from China. Brian Tang, from Hong Kong, got a Golden Visa last year. He says demand is so high in China, that he's opened a branch of his immigration agency CBIEC, in Lisbon, to put people like Li in touch with Portuguese estate agents. "There's a huge appetite from China coming over to Portugal. Eighty per cent of the applicants are Chinese," says Brian Tang. He says part of the appeal is the flexibility. 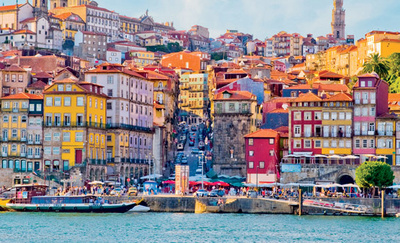 Foreigners only have to be in Portugal for seven days in the first year of residency. But the growth in schemes like this across Europe is an issue of concern for some in Portugal who think it is effectively selling access to the EU. I meet Socialist MEP Ana Gomes for coffee in central Lisbon. As we watch the tram trundle along the cobbled street past an estate agent office emblazoned with the words Golden Visa, she tells me it is bad for Europe. "I think this is indeed a race to the bottom, and it's actually something very anti-EU," says Mrs Gomes. "Each country is trying to out-do the other in terms of better conditions to attract all this foreign money." Ratings agency Fitch has upgraded its outlook for Portugal to "positive" and maintained the country's credit rating at BB+. Fitch justified its move by citing budgetary efforts agreed by Lisbon as well as the overall recovering economy of the country three years after its bailout. "Portugal is making good progress in reducing its budget deficit," the ratings agency said in a statement. The economy took a big step towards emerging from its debt bailout and regaining investor confidence late last month by beating its budget target by a wide margin. Portugal is still struggling to overcome its debt crisis, to pull away from recession and overcome public anger at tough austerity measures. It turned in a budget overshoot equivalent to 4.9% of output last year. That marked a huge reduction from a public deficit of 6.4% in 2012. But despite this marked progress in reducing the annual deficit, the gap between spending and revenues, the public debt of accumulated past deficits rose to 129% of output last year from 124.1% in 2012. The debt now amounts to €213.63 billion, the statistics office Ine said. Fitch forecast the Portuguese economy to grow by 1.3% this year and 1.5% in 2015. In the second half of last year, the economy pulled out of recession to show growth of 1.1% and this also helped public finances, since growth raises tax income and reduces some costs. The recovery, ending two and a half years of recession, held in the fourth quarter when the economy grew by 0.6% on a quarterly basis. In May 2011, Portugal was rescued by the International Monetary Fund and by the European Union with loans totalling €78 billion on condition that the country enacts deep structural reforms to correct public finances and raise efficiency in the economy. Across much of Continental Europe, the euro crisis did in just a few years what political parties in Britain and the United States had been hacking away at for decades: shrink the size of government. That is true perhaps no more so than here in Portugal. Since the onset of the crisis, the government has shed assets including Portugal’s airport management company, a highway operator and the national postal service. But when it came to selling off a collection of works by the Catalan artist Joan Miró, it was for some a step too far. The government’s announcement that it would sell the collection through the auction house Christie’s in London set off intense discussion of what kind of assets the state should be allowed to sell, and whether the nation’s cultural heritage is off limits. Portugal’s controversy has now become part of a broader debate across Europe’s hard-hit, if historically treasured, southern tier over the virtues and limits of downsizing government, often cantered on the public preservation or privatization of cultural patrimony that touches on the raw nerves of national identity. “The obsession with eliminating everything that is public is leading the government to go further down the privatization road, and perhaps they consider paintings to be part of the same strategy,” said Gabriela Canavilhas, a Socialist lawmaker and Portugal’s former culture minister. “But even in Detroit, which was declared bankrupt, their final decision was not to sell any art.” Ms. Canavilhas is among those who are pursuing legal action to prevent the sale of the works and instead have them classified as national heritage. The issue was debated in Parliament on Wednesday, but without reaching any conclusion. Amid an outcry, Christie’s cancelled the auction in February, citing legal concerns over whether Portugal was entitled to sell the works. The auction house recently announced that the sale would go ahead in June, though the anguish surrounding the government’s move has hardly eased, and it has become emblematic of similar debates elsewhere. Greece has the most ambitious privatization program, including the pending sale of its gas company and island properties, as it has pledged to sell assets worth 11 billion euros, or $15 billion, by the end of 2015 to cut its debts and pay back creditors. But even its plans have been scaled back amid botched transactions and mismanagement. A recent decision by the Greek government to sell a handful of properties under the Acropolis prompted a fierce backlash from critics who argued that instead of privatizing the historic district in the heart of Athens, the authorities should preserve it as something belonging to all Greeks. In Spain, the mere hint that state-run theatres in Madrid would be sold off has generated street protests by actors and others fearful of the impact on the arts. And in Italy, the cultural debate has focused more on the government’s failure to invest in and safeguard historic sites like Pompeii, where neglect has become tantamount to forfeiture. Here in Portugal, critics charge that the economic crisis has been used to justify the kinds of political moves that have already largely reshaped economies in places like the United States and Britain since the era of Ronald Reagan and Margaret Thatcher: selling off assets and subcontracting or outsourcing state services. Portugal has already sold about $11 billion in assets. While such efforts have not always produced the savings their proponents promised, governments in Europe, where the state sector takes up a larger share of the economy than in the United States, have belatedly taken up the idea of privatization, saying the financial crisis has left them little choice. The economic slump in some euro zone countries may be easing, but the debt burdens that precipitated the crisis show few signs of lightening. In some cases, they have grown worse, as tax revenue fails to rebound amid paralyzing levels of unemployment and anaemic growth. Trying to balance its books, Portugal’s centre-right coalition government has already made deep spending cuts to social services — including education and welfare programs — to comply with the terms of an international bailout negotiated in 2011. Socialist opposition politicians are struggling to draw a line at the Miró collection.